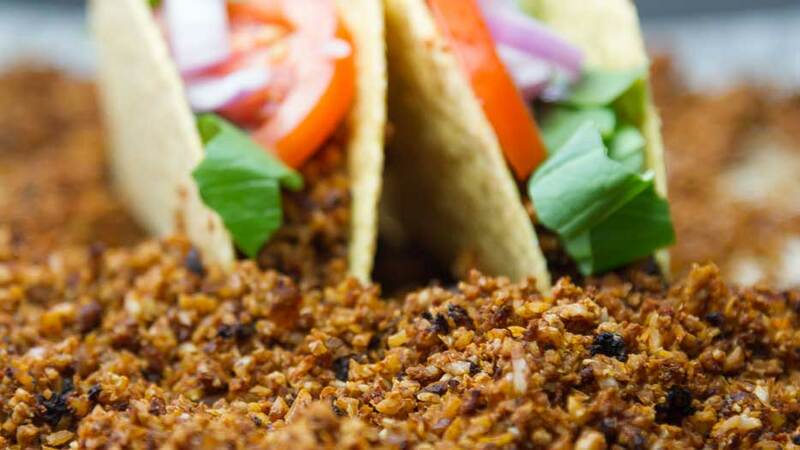 This is a 100% plant based vegan meat substitute that you can use as taco meat, pizza topping, in Bolognese sauce, in lasagna and many more recipes. If you are looking for a great mince meat alternative that is soy free, then this tasty cauliflower and walnut mixture is perfect. 100% plant based and cholesterol free – this is the ultimate in healthy cooking that tastes amazing! 750 Grams Cauliflower ( 1 medium sized cauliflower ) chopped into large chunks including the core. To get started with this recipe you will need either a food processor or good chopping knife and board. You will also need a mixing spoon and a lined baking tray. Put all the ingredients into the food processor and pulse to a coarse blend (or chop finely by hand). Turn your oven on to 175 ° C / 350 ° F to preheat, then get your lined baking tray and spread the mixture evenly over the tray. Pop the mixture in the oven for 30 minutes, then take it out and stir the mixture before baking again for 15 minutes. Take it out and check again. In my case it needed a further 10 minutes before the crumble was cooked through and the mixture was dry enough. You can cook this much quicker if you spread the mixture over a couple of trays rather than just one. Adjust according to your oven settings and quantity being made. Once cooked you can now store this crumble in the fridge ready to make pasta sauces, lasagne, taco meat, pizza toppings and much more! So easy and so Yummy! Looks like you can make a big batch easily. Would there be any problem freezing this? Great sounding recipe Anja. Thank you for sharing, I will make the lasagne tomorrow. Awsome recipe. This is the second time I made it. I added a couple of more spices, garlic powder and cumin this time. I frozed the leftover of my first batch and it holds flavor and texture as recently made. I used it for tacos, Moussaka, and shepper’s pie. The sky is the limit. Great recipe Anya, Thank you so much for sharing. Hello, I am going to try this recipe, it seems really good. Just a question here. I am allergic to tomatoes, so wondering with what I could replace tomatoe paste? Also I don’t think we have amino braggs in Germany (where I live). Could I replace with something else (no soy, tamari ecc)? Thanks a million! I’m wondering what brand your food processor is? Fantastic 🙂 So glad the recipes are helping you. Love your channel. I want to try this recipe but can’t use the walnuts because my son is allergic to tree nuts. Can I substitute with chick peas? Anja , this looks great but what can I use instead of walnuts do you think ? Chickpeas and a little sesame oil maybe ? Sorry just saw your answer to this question already . I am very sorry . Thanks so much for this wonderful recipe! I have used it now to make tacos and chilli with red kidney beans. It works so well. Can’t wait to try it for bolognese. I am really grateful to be able to eat these meals again without the bloating that soy-based vegan minces gave me. Fantastic Liz… so glad you like the recipe and that you are using it in so many different dishes. Plus, awesome that you are feeling better for it too! I am making the switch to vegan and my 2 toddlers loved this. I am planning to make this a few different ways but tonight i did it as a cornbread topped skillet chili. It was so awesome. Thank you for posting easy vegan alternatives like this. I cant wait to try out the cheeses. Hi Anja, I have been eyeballing this recipe for a few months now in my favorites, and I am getting ready to finally make some vegan meat using it. I love chorizo, so I am also thinking about making chorizo with it, too. I am sooooooo excited about this! Thank you for sharing all of these wonderful recipes. I follow a plant-based lifestyle and I am ALWAYS looking for ways to eat exciting meals. Hi Anja, I made it!!!!! It was totally awesome. Only I didn’t put it in the oven, I used a dry skillet on top of the stove, because I wanted to hurry up and eat it, but for the time that I cooked it, I could have just put it in the oven and been done with it. I love seasonings and spices, so that’s what I did added seasonings and spices. It turned out looking more like ground turkey burger than ground beef, but I loved it!!! A friend came over and I showed it to her, she couldn’t believe it wasn’t meat, she wanted to taste it, and then she asked for some. I had some tortillas and so that is how I prepared it for her. She was all smiles. She left our house to go home and prepare it for her husband and kids. She said it was seasoned very well and that the more she talked to me about my way of eating the more she was becoming convinced that she could change her diet and her family’s to plant based. Thanks sooooooo much for this awesome recipe!!!!! Not walnutty at all, I just made it. I added a few extra things but baked as noted. I added to it Portobello Mushrooms, sun dried tomatos instead of tomato paste, carrot, onion, garlic. No spices just soy sauce so I can season it when I make a dish. Even just the veggie baked crumble was amazing. Thank you for this substitute! Thank you SO much for this recipe! I’ve been looking for a good substitute that had no soy and gluten! I know tamari is in this and that’s soy, but could you even substitute that? I’ve read different things on soy and fermented soy is actually suppose to be ” healthy”. Another search said that Tamari was under fermented soy so I’ve still been using it. Either way this is a lifesaver recipe so I appreciate you greatly! Take care! I used some of your ingredients and added processed mushroom paste instead of tomatoe pasteto a batch along with pecans in addition to the walnuts.. it came out really good for a first attempt and I think it tastes closed to groung beef. Thanks for posting this recipe. not sure if you are still answering questions posted for this recipe but I’ll post anyway and hope you get it. My mom has stage four lung cancer and she is on an all vegan diet, but she can’t use Bragg’s or soy sauce or tahini, etc. Does the recipe have to have these added? I would love to surprise her with this addition to her diet. Thank you in advance. Would it be OK to leave out the walnuts? My dear hubbie is vegan, he can’t eat any nuts. Wow! I made this fantastic recipe for ground ‘meat’ at the weekend and I layered it with aubergine, roasted cauliflower, courgette and a cheese sauce made with potato & carrots and then I topped it off with panko breadcrumbs and it was absolutely delicious – the cauliflower and walnut mince was to die for – thank you for your fab videos and website, you truly are inspirational. I plan to use my first batch in chili. Do you recommend adding the “Beef” at the beginning of the cooking of the chili, or toward the end? Thanks. If I wanted to make these mexican for tacos would I add the taco seasoning to the mix before I cooked it in the oven or afterwards in a fry pan like traditional meat? I would add it towards the end or afterwards so that the spices don’t burn. Would this work well in things that you would cook with it in such as chilli? Or should it just be added at the end? I would add it at the end. Otherwise it might go too mushy. Hi Anja, thank you for sharing this! This is a very useful recipe. Are there any vegetables I can replace cauliflower with? I have a problem digesting cauliflower, that’s why as much as possible I avoid eating them. This is the third or fourth recipe I’ve looked at that claims to be soy free yet lists Tamari as an ingredient. Am I missing something??? Last I checked Tamari is still soy sauce! Yes tamari is soy… you can use coconut aminos. Thank you for your comment. is there something I can replace the walnuts with? My daughter is allergic to nuts but I’m really needing a recipe like this one. You could try pecan or brazil nuts… or use all cauliflower. Do you have the nutrition facts on this recipe? Hi there! I made this for dinner last night (For taco salad) and it was a success. I’m just wondering if you think it could be “dried” in a food dehydrator? So glad you are enjoying my recipes 🙂 I haven’t tried using a dehydrator for this. If you try it please let me know how it turns out. Hi. I love your food processor. What brand is it? This looks and sounds delicious, I am going to try it tomorrow when I go shopping! I was wondering if I didn’t bake it pass 30 minutes would I be Abe to leave in the oven for baked foods or should I bake it all the way, you know the “commercial” crumbles only give you 5 minutes.